performance alongside Carolina Crown members. Last night in Normal, Ill., drum corps shook things up in Illinois State University's Hancock Stadium. Carolina Crown took first place, followed closely by the rousing performances of the Cadets, the Cavaliers and the Blue Stars. Also present were the Madison Scouts, Glassmen, Colts, and Pioneer, all of whom made a lasting impression on the hundreds of students in the audience from the Music for All Summer Symposium. Carolina Crown (78.700) took the first place position, entertaining the crowd with its program, "A Second Chance." In a departure from "normal" with gold-lacquered instruments and a radical uniform change, the corps nevertheless brought the audience to its feet especially during an encore performance with Summer Symposium marching band students. The high schoolers had the opportunity throughout the week to interact with Carolina Crown working up to Friday night's finale where they performed a segment of Crown's show alongside corps members. "It's always exciting when we win, but that isn't our main objective," said Crown drum major Blake Daughtrey. "The most important part of the week was being able to work with the Music For All marching band students and performing with them." "It was a big deal for the kids because for a lot of them this is their dream," said drum major Preston Cheek. "It was really cool because there's a student next to you and he's all wide-eyed. The experience gives them something to look up to, something to inspire to." Returning to the DCI Central Illinois event was Mary Foster, an audience member from St. Louis, Missouri. "My favorite part of the show was watching my son play in the Music for All Summer Symposium," said Foster. Though never a corps member, she participated in marching band and appreciates the visual demand of the drum corps activity. "I like the shows that have props," Foster said, "but when it's music I recognize, that makes a big difference." Crown wasn't the only corps to earn the love of this crowd. 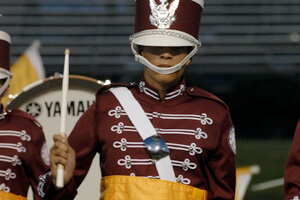 Taking the number two spot were the Cadets with their production "Toy Souldier." The program mixes "old school" elements with more modern designs, all leading to a high-energy performance last night. Behind them in third place were the Cavaliers (75.200), with the intense and visually demanding production, "Mad World." 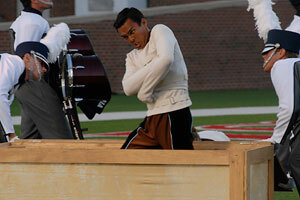 "It shows the craziness that goes on in the world," said Bobby Hoyt, a Cavaliers snare drummer. "A lot of the show is about the crazy things that happen in the world and how people deal with it. It's recognizing the madness that's around us." Fellow snare drummer JP Gagaza added that being in the snare line is "a lot of hard work, but if you just keep driving, it's good. No matter how 'mad' it is, you just smile." Along with the unpredictable "madness" of last night's show, the Blue Stars (4th, 74.000) mystified and entranced the audience with "Houdini." The corps members' work of the past weeks showed in this competition, with improved horn line and percussion performances, not to mention the visual impact of color guard members setting the theme in straitjackets during the production's opening number. In fifth place were the Madison Scouts (71.600), again pleasing the crowd with "Slaughter on 10th Avenue" and "Rhapsody in Blue" in what could be one of the year's most entertaining shows for fans. The Glassmen (69.500) took sixth place last night with "A Prayer Cycle." The corps has been busy the last few days, traveling from its spring training site in Oakshade, Ohio to Indianapolis, Ind., and back through Illinois for the DCI Central Illinois event. The Colts (7th, 67.300) performed their program "True Colors" in their first show of the 2010 season. Footage of recent rehearsals and a few words from members is now up on the DCI Fan Network. Pioneer (8th, 59.500) may have fallen a bit with its score Friday night, but the corps members' passion for their 2010 production "Corps Prayer" and bond as teammates shows both on and off the field. "What it means to me is something you can't describe," said Warren Erasmus, a 19-year-old trumpet player from South Africa. "It's friendship and togetherness for the hardworking members of this corps. At first I thought, 'wow, this is really hard,' but as time goes on you get to learn about new people from all over America. It gets easier and more exciting." Complete performances from the DCI Central Illinois Premier event are now available for on demand playback on the DCI Fan Network. Subscriptions starting at just $39 will give you access to these videos along with more than 15 other 2010 DCI Tour Events. Watch last night's DCI Central Illinois performances on the Fan Network. View a complete recap of scores from this event.